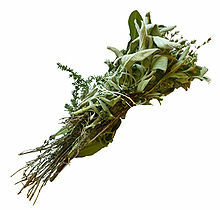 The bouquet garni (French for “garnished bouquet”; pronounced [bukɛ ɡaʁni]) is a bundle of herbs usually tied together with string and mainly used to prepare soup, stock, casseroles and various stews. The bouquet is cooked with the other ingredients, but is removed prior to consumption. Liquid remaining in the bouquet garni can be wrung out into the dish. There is no generic recipe for bouquet garni, but most French recipes include thyme, bay leaf and parsley. Depending on the recipe, the bouquet garni may also include basil, burnet, chervil, rosemary, peppercorns, savory and tarragon. Vegetables such as carrot, celery (leaves or leaf stalks), celeriac, leek, onion and parsley root are sometimes included in the bouquet. In Provence, it is not uncommon to add a slice or two of dried orange peel. Sometimes, the bouquet is not bound with string, and its ingredients are filled into a small sachet, a piece of celery stalk, a net, or even a tea strainer, instead. Traditionally, the aromatics are bound within leek leaves, though a coffee filter (or cheesecloth or muslin) and butcher twine can be used, instead. The term is an antiquated name for the bouquet garni. ^ a b c Hensperger, B.; Kaufmann, J. (2004). Not Your Mother’s Slow Cooker Cookbook. NYM Series. Harvard Common Press. p. 92. ISBN 978-1-55832-245-5. Retrieved January 15, 2017. ^ a b Darling, J. (2002). Better Homes and Gardens New Cook Book. Better Homes & Gardens New Cookbooks. Meredith Books. p. 45. ISBN 978-0-696-21532-2. Retrieved January 15, 2017. ^ a b “Bouquet garni recipes”. BBC. Retrieved 6 October 2017. ^ Reichl, R.; Willoughby, J.; Stewart, Z.E. (2006). The Gourmet Cookbook: More Than 1000 Recipes. Houghton Mifflin. p. 106. ISBN 978-0-618-80692-8. Retrieved January 15, 2017. ^ Farmer, J. (2011). A Time to Plant. Gibbs Smith. p. 70. ISBN 978-1-4236-2347-2. Retrieved January 16, 2017. ^ Escoffier, Auguste (1907). A Guide to Modern Cookery. London: William Heinemann. p. 72. OCLC 5362680. OL 24167463M. Retrieved September 22, 2014. ^ The Health exhibition literature. The Health exhibition literature. W. Clowes & Sons. 1884. p. 231. Retrieved January 16, 2017. ^ a b Morgan, L.B. ; McCormick, A. (2015). Homegrown Herb Garden: A Guide to Growing and Culinary Uses. Quarry Books. p. 60. ISBN 978-1-59253-982-6. Retrieved January 15, 2017. ^ Dryansky, G.; Dryansky, J. (2012). Coquilles, Calva, and CrÃ¨me: Exploring France’s Culinary Heritage: A Love Affair with French Food. Pegasus Books. p. 92. ISBN 978-1-4532-4926-0. Retrieved January 16, 2017. ^ Kundrat, A.; Webster, S. (2014). Fairfield County Chef’s Table: Extraordinary Recipes from Connecticut’s Gold Coast. Chef’s Table. Lyons Press. p. 95. ISBN 978-1-4930-0873-5. Retrieved January 16, 2017. ^ Rumble, V.R. (2009). Soup Through the Ages: A Culinary History with Period Recipes. McFarland, Incorporated Publishers. p. 66. ISBN 978-0-7864-5390-0. Retrieved January 16, 2017. ^ Peterson, J. (2003). Essentials of Cooking. Artisan. p. 126. ISBN 978-1-57965-236-4. Retrieved January 16, 2017. ^ Badcock-Walters, T. (2008). Cultivating Flavour. Lizard’s Leap Press. p. 27. ISBN 978-0-9814173-0-1. Retrieved January 16, 2017. ^ Osbaldeston, P. (2007). The Palm Springs Diner’s Bible. Pelican Publishing Company. p. 260. ISBN 978-1-58980-470-8. Retrieved January 16, 2017. ^ Rombauer, I.S. ; Becker, M.R. ; Becker, E.; Guarnaschelli, M. (1997). JOC All New Rev. – 1997. Scribner. p. 686. ISBN 978-0-684-81870-2. Retrieved January 16, 2017. ^ Rappaport, R. (2013). The Big Book of Slow Cooker Recipes. Adams Media. p. 478. ISBN 978-1-4405-6069-9. Retrieved January 15, 2017. ^ Moine, M.P. ; Wickenden, N. (1994). Chicken and Other Poultry Dishes: Les Poulets Et Volailles. Marie-Pierre Moine’s French Kitchen. Simon & Schuster. p. 14. ISBN 978-0-671-89658-4. Retrieved January 16, 2017.